John H. Cape, who since 1886 has been a resident of Joplin and has been actively associated with mining interests, is a native of southeastern Missouri, his birth having occurred near Desota. His people were pioneers of that portion of the state and took an active part in its development and upbuilding, reclaiming its wild lands for purposes of civilization. The boyhood days of our subject were quietly passed. He had some duties to perform and in the school-room he passed a portion of his time and also enjoyed the pleasures of the playground. Since entering upon his business career he has worked his way steadily upward, overcoming all difficulties and obstacles in his path by determined purpose and energy. He has been connected with the St. Louis Ore & Steel Company and the St. Joseph Lead Company, acting as superintendent of both through a considerable period. In 1886 he came to Joplin and acted as superintendent for different companies, and since 1900 has superintended the Royal Blue mine on the Granby land and the Imperial mine on the Continental land. These mines were opened in 1896 and the former was known as Blakny No. 2 and the latter as the Lead Mule mine. Before the present company was incorporated he was in the service of the Luther Company, controlling the Lead Mule mine. Since first assuming control of these mines Mr. Cape has remained in continuous charge, superintending their operation, and he also operates two mines ,on his own account, one of which is the Jackson, Jr. He is also engaged in prospecting to a considerable extent, and has done much to develop the mineral resources of the county and thus add to the general prosperity of the stockholders. He is well qualified for his present position, for long study and experience have enabled him to quickly recognize the possibilities of ore, the quality of the metal and what it will produce. The lady who now bears the name of Mrs. Cape was Miss Anna Grace in her maidenhood, a daughter of Thomas J. Grace, a pioneer settler of Chariton county, Missouri, where occurred the birth of Mrs. Cape, who is a most estimable lady, and with her husband enjoys the high regard of many friends. This union has resulted in the birth of one daughter, Marvel A. He is a Mason and belongs to the blue lodge, chapter and council, and in his life he exemplifies the beneficent and helpful spirit of the fraternity. The fate of Cape’s cottage is a mystery. 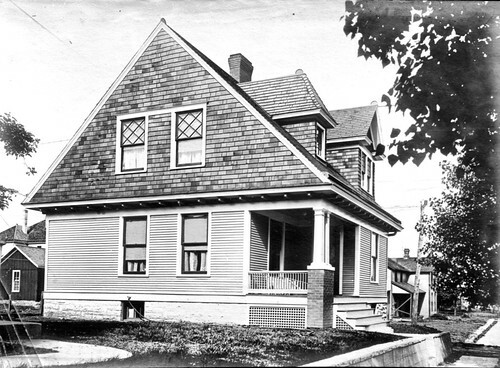 According to one city directory, in 1905-1906, Cape lived at 101 N. Byers, but by 1910, resided at 410 Moffet Avenue. An examination of the existing addresses reveals no homes that match the exact appearance of the cottage, though, the Byers address reveals a new house which may have been built in the same location. Do you recognize the cottage? Do you know its fate?